WASHINGTON (June 13, 2008) -- Visitors to the Pentagon were treated June 13 to a look at a prototype of the Non-Line of Sight Cannon. Prototype 1 of the NLOS-C was on display in the south Pentagon parking. With the engine on the vehicle running, and hot air shooting from the rear exhaust vents, the turret and cannon aboard the weapons system spun around and moved through the automated sequences needed to fire one of its 100-pound projectiles. 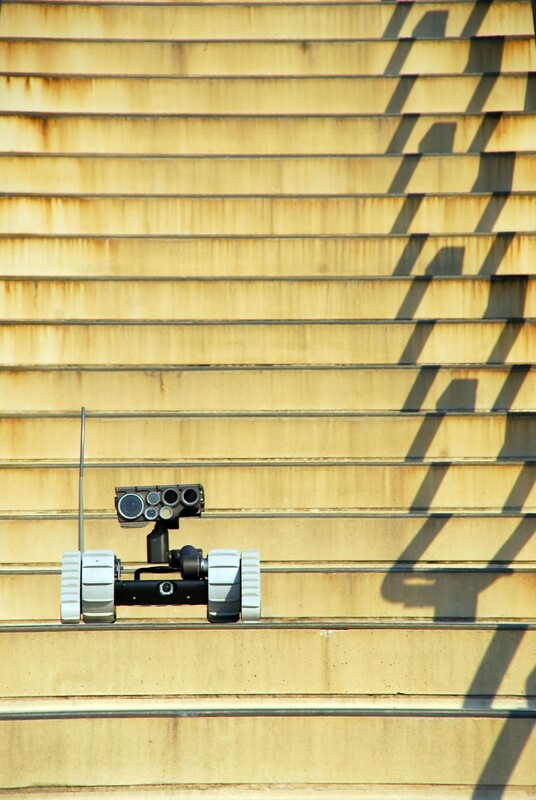 A Small Unmanned Ground Vehicle rests on the stairs of the south parking lot catwalk to corridor three in the Pentagon, June 13. The SUGV is part of Future Combat Systems and was one of several pieces of FCS hardware on display at the Pentagon. The NLOS-C is part of Future Combat Systems. The prototype on display at the Pentagon is the first of eight such vehicles that will be delivered to Yuma Proving Ground, Ariz., by 2010. Other pieces of FCS hardware on display at the Pentagon included the Multifunctional Utility/Logistics and Equipment vehicle, the Small Unmanned Ground Vehicle and several Tactical Unattended Ground Sensors. Soldiers from the Training and Doctrine Command demonstrated capabilities of the FCS, including the NLOS-C, by conducting a hardware and software simulation of the system for Soldiers, Army senior leaders and members of the press. Also at the demonstration were young civilians and current Soldiers scheduled to enlist or re-enlist as part of the Army's birthday celebrations in the Pentagon courtyard. The simulation used dozens of computers and involved more than eight Soldiers simulating those who would be in an FCS Command and Control Vehicle and an NLOS-C.
Sgt. 1st Class Harrison Jackson served as the "vehicle commander" of the simulated NLOS-C. He has served in the Army since 1986, comes from an artillery background, and has combat experience in the M-109A5 "Paladin." He says the NLOS-C will enhance the war fight for Soldiers by making their jobs easier. "When you think about artillery, they have a lot of manual labor right now, insofar as lifting rounds -- but all that's going to go away," he said. "It takes nine Soldiers now in a Paladin. With the NLOS-C you've reduced that to two Soldiers. And the Soldiers don't touch anything -- that's the luxury of this. And the response time, as seen in the demo, is much better." Staff Sgt. Stephen Card, an infantryman, was at the Pentagon to re-enlist. He's already served 10 years and two tours in Afghanistan. Before the ceremony in the Pentagon courtyard, he was able to look at some of the FCS equipment that might be fielded in the next few years -- particularly the Class I and Class IV Unmanned Air Vehicles. "The UAV keeps you from having to go into something almost blind," he said. "The biggest thing we have now in urban environments is you never know what's around the corner. You start running down a street going after something -- some objective -- and what is around corner 'A' to your left is your immediate threat. But you never think about that, because you are focused on something further down the line. So anything that gives us a feed on what is going on around us is great." He said technology in the field now -- like the Force XXI Battlefield Command Brigade and Below, called FBCB2 or "Blue Force Tracker" -- is good. But doesn't deliver what he expects FCS will be able to do. "The leadership has the FBCB2, but we are not really getting live imagery of what is really going on," he said, noting that sometimes the latest intelligence is either being routed through the system via e-mail or is not coming at all due to communications outages. FCS hardware, like the Class I UAV, will be fielded down to the platoon level, putting control of real-time imagery into the hands of Soldiers like Card. "That stuff I saw -- it's on the ground, we're controlling it, and it provides real-time imagery without having to put ourselves in danger -- and that's great," he said.